Many of you probably know already that I recently graduated with a degree in nutrition science. When I was asked to review The Doctor On Demand Diet book, the first thing I did was read about the author. When I saw all her credentials and years of experience, I couldn’t wait to get my hands on this book. While I received this book for review, all thoughts and opinions are my own. One of my biggest peeves since getting a formal education in nutrition is seeing all the ‘experts’ out there that flood the internet and shelves with inaccurate or unproven information. It’s beyond upsetting because there are so many of us desperate to understand the complicated world of food and health. Most medical doctors only take one class in nutrition during their years of education. It is for this reason, nutrition advice should be given only by those that understand food as a science and know to back their information with proven studies and peer reviewed articles. Dr. Melina Jampolis is an internist and board-certified Physician Nutrition Specialist–one of only several hundred practicing in the U.S. She’s basically a food doctor. In most hospitals you’d need a medical doctor and/or specialist PLUS a Registered Dietitian (RD) to work together to help with your diet and illness treatment. But with Dr. Melina, you’re basically getting two in one! She specializes in nutrition for weight loss, disease prevention, and treatment. In reading her book, you realize she’s very personable and not just trying to cram a bunch of science down your throat or make false promises. …I’ll help you figure out how to find a balance that allows you to lose weight without losing your mind. She talks to you about the facts, explains them logically, and encourages you to make small changes that won’t make you lose your mind and inevitably rebound. Because let’s face it–losing weight and getting healthy is actually really, really simple. It’s just freaking hard to make changes and navigate the complex world of macro- and micro- nutrients. So she put together a plan that can be tweaked to anyone’s needs–even if you’ve got allergies or diseases. Knowing what to eat is tough. Everyone is telling you something different and recommending opposite methods for your goals. Then you’ve got billboards, commercials, social media, etc. pouring images of delightful indulgent foods in your face all day. Then you’ve got all these big words and calculations to figure out. If you’re trying to manage a disease state like diabetes or heart disease, then there’s all that added stress. Plus, food is yummy. For most people it’s a social event in itself. This is why everyone should read The Doctor On Demand Diet book. It clearly explains how you can deal with all this chaos with ease and simply live your life while getting and being healthy. She doesn’t tell you never to eat pizza or cookies again. In fact, she doesn’t recommend strict restrictions at all. Just find what works for you and do it. Because it works. 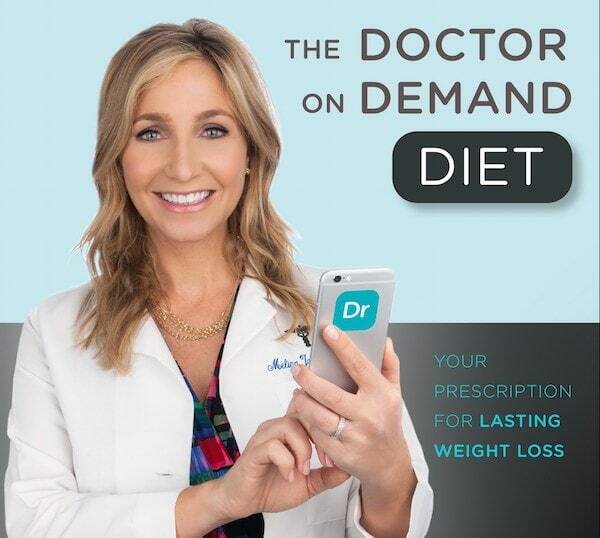 The Doctor On Demand Diet Book is available for purchase starting November 10, 2015. But you can pre-order now and enter to win one below. Don’t Miss the Twitter Chat! This is an incredible opportunity to ask Dr. Melina any questions you may have about your own personal health journey! I know I have a whole list for her! 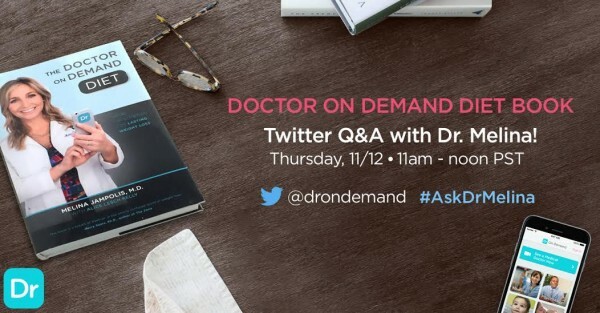 Simply tweet her @drondemand using #AskDrMelina on Thursday, November 12, 2015 from 11am – noon PST. 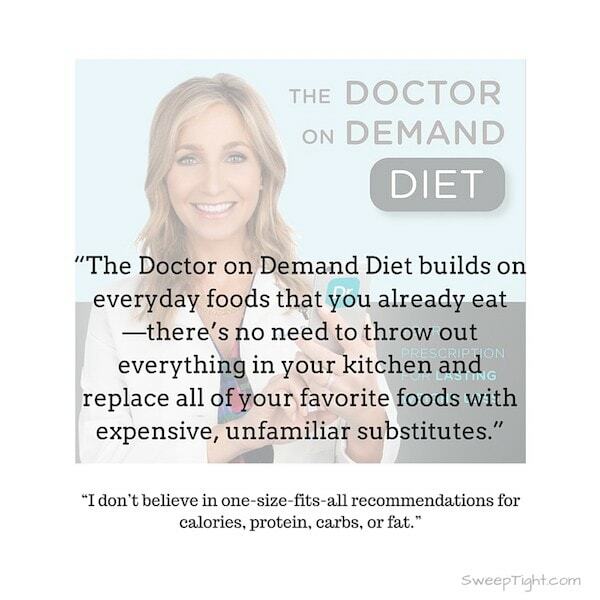 What about The Doctor on Demand Diet is most exciting to you? Doctor on Demand sounds like an exciting new realm into medical practice. The cost is reasonable and you always have a doctor available when your local offices might be closed. I would enjoy reading the Doctor on Demand Diet book as I have a hard time getting motivated to lose weight.